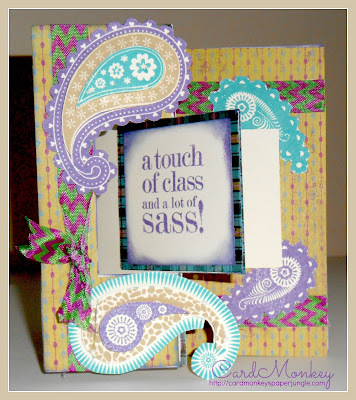 CardMonkey's Paper Jungle: A Touch of Class and a Lot of Sass! Ahhh, the summertime. For some, it's the time of relaxation and kicking back. For others -- particularly those in the crafting industry -- the season is filled with new releases. Close To My Heart unveils its new products next week; Stampin' Up had its convention last week, and this week, there's the summer reveals at the Craft and Hobby Association (CHA) show in Las Vegas! Adorable!! I love the bright colors! Another home-run Ellen! I love everything about this... the papers, the Fun Footz (of course!) and the paisleys... which is funny bc I'm not a paisley person! And the Mexican jumping bean analogy had me in stitches!!! I love this. I love the Chevron, love the paper, the colors...all of it. You are so inspirational to me.